Besides the falling leaves and nippy weather, autumn is known for the bounty of the harvest. A plethora of fruits and vegetables come into season, allowing communities to stock up on important produce before the winter freeze. The fall harvest is a magical and beautiful time for agricultural communities around the world, and Niagara Falls is no exception. The Niagara region is astoundingly fertile, and plenty of farms and orchards produce tons of deliciously fresh produce for local restaurants and grocery stores. Some of these places allow visitors to come pick their own fresh fruit and vegetables and experience the fertility of the harvest for themselves. 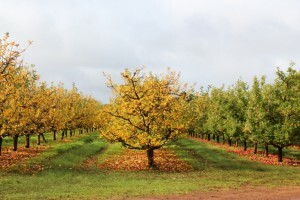 If you want access to the choicest produce, plan a trip to one of Niagara’s orchards on during your fall trip the falls. Apples are the only fruit the orchard is sure to have in October, but if any of the other fruits look enticing, you can plan your trip around the fruit season. Also on the premises is a fully stocked gift shop with already-picked fruits ready for you to take home in addition to various jams, jellies, and pies made fresh from the farm. Bring a bit of your orchard experience home or give a gift to your friends who couldn’t come. Also near Niagara-on-the-Lake, Kurtz Orchards Farm and Marketplace offers plenty of fresh produce and products for travelers looking for Canada’s harvest bounty. Take a tour of the grounds and see the fruitful trees and fields in all their glory. In the Kurtz Marketplace, you’ll have access to a completely unique orchard experience. Fresh fruits, including peaches, cherries, apricots, plums, strawberries, and more, are piled high waiting for you to sink your teeth. Also fresh from the farm are aged specialty cheeses and various fruit pastries and ice creams that are unparalleled in the region. Or, if preserves are more your style, sample some of the jams, jellies, and pickled goods available for purchase. You will be able to sample new gourmet tastes created from international inspiration or even take a full lunch with fresh ingredients from the on-site bakery. You can be sure that the food you eat at Kurtz will be local, fresh, and seasonal, made from the highest quality ingredients you could imagine. While you dine, you’ll get views of the gorgeous orchard grounds, replete with turning autumn leaves. If you fall in love with more than just Niagara on your visit, Kurtz Orchards is a beautiful place to host wedding ceremonies or receptions, and they are happy to cater with their delicious and fresh cuisine.